Fortress Press publishes the Texts @ Contexts series, the goal of which is to bring voices outside of the North American and Western European contexts more fully into conversation with biblical scholarship. 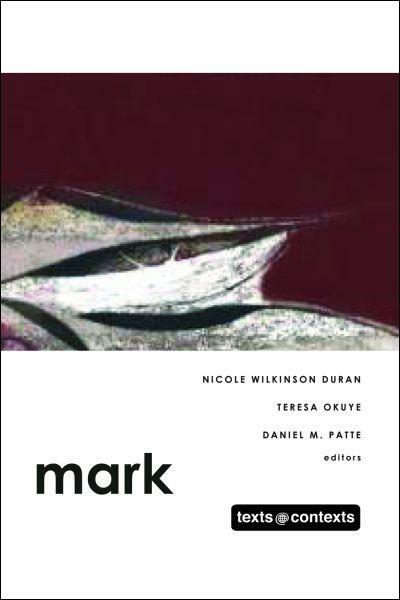 The volume on Mark has come out recently, edited by Nicole Wilkinson Duran, Teresa Okure, and Daniel M. Patte. I'm not going to review the book here. I'll just offer a few thoughts and questions that I had after reading it. One aspect that I found interesting was the book's treatment of healing and exorcism. There are three essays on these topics. People who live in non-Western contexts often understand healing and exorcism quite differently than we who live in North America and Western Europe. I found this the most interesting part of the book. I only wish there had been more on this issue and that the essays had pushed a bit harder on these points. There's quite a bit of post-colonial scholarship in the book. This is an important part of engagement with the two-thirds world. Yet I wonder if the degree to which the concerns of post-colonial criticism are represented in this book is proportionately represented in the religious lives and experiences of Christians in these contexts. I don't know the answer... just wondering. Christianity is spreading rapidly through the global south, a fact which represents an evangelistic, proselytizing concern on the part of these Christians. I didn't see that perspective represented in the book, though, despite the fact that there is ample material in Mark that could lead one to reflect on issues related to evangelism. All in all, despite the fact that I have some concerns, this is a helpful read. If you want think through the ways in which our cultural contexts shape our readings of the biblical texts, this book will prove a helpful resource. Well, I didn't find any good bbq in downtown Atlanta (though I can't say that I tried very hard). I ran into a lot of old friends, though, which was nice. On Friday night of the conference I had the opportunity to hear N. T. Wright give a lecture called "The Kingdom and the Cross." It was typical N. T. Wright: eloquent, theologically interesting, and thought provoking. Yet the highlight of the evening, in my opinion, was the respondent, Michael Bird of Crossway College (Australia). Bird's response was not only pointed and well informed, but engaging, humorous, and well delivered. Though relatively young, Bird is certainly making a name for himself in the field. On Sunday night, the Association of Theological Schools honored Dr. Kathleen O'Connor of Columbia Theological Seminary for her work in theological education. O'Connor gave an outstanding address on the vocation of the theological educator and the need to listen to voices speaking from a variety of contexts as we engage the Bible in the classroom. Every time I attend SBL I'm more keenly aware of how much I have to learn. Then again, I suppose that's at least part of the point. Complacency is the enemy of good scholarship. I'm off to the annual meeting of the Society of Biblical Literature in Atlanta today. This is always a really beneficial conference. For me personally, the sections on the Bible and disability and social-scientific criticism of the NT are very important. Add in the lecture by N. T. Wright tonight, numerous receptions, and a chance to catch up with some old friends, and it should be an enjoyable weekend. Plus, there's nothing like southern barbeque! Last week I was reading through the proofs of an article that I've written and will come out later this year. The article compares the ancient novel The Life of Aesop and the Gospel of Mark. Coming back to this text, it struck me again just how deeply countercultural Mark is. Read through this text carefully. Spend time in it. And think through the challenges that Jesus offers in this story. I think of the words of Jesus' followers in John: "This teaching is hard." This especially the case Mark 8, 9, and 10. Hard stuff.